WASHINGTON — The political fallout from President Donald Trump’s push for his border wall is giving rise to overwrought rhetoric from Republicans and Democrats alike. Trump, as he has so often done, claimed progress on the wall that isn’t borne out by what’s going on along the border. In the Democrats’ 2020 presidential campaign, Trump was assailed for confining kids in “cages,” though his administration’s fenced facilities for migrant children are the same the Obama administration used to hold children by the thousands. 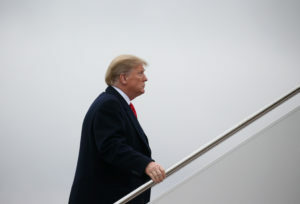 And a Republican senator, seeking to show there’s a low bar for presidents to declare a national emergency, asserted President Barack Obama took that step against the swine flu even when there were no cases of that malady in the country. Actually, more than 1,000 Americans had died from that flu before Obama made his emergency declaration in 2009. On other fronts, Trump misrepresented the history of U.S. diplomacy with North Korea as he anticipated his summit this coming week with that country’s leader. And with the special counsel’s Russia investigation possibly close to wrapping up, he revisited past attempts to discredit a “rigged” probe. TRUMP: “We have just built this powerful Wall in New Mexico. Completed on January 30, 2019 – 47 days ahead of schedule! Many miles more now under construction! #FinishTheWall.” — tweet Wednesday. Construction was beginning this month for 14 miles (22 km) of new fencing in the Rio Grande Valley in Texas — the first additional miles of barrier in Trump’s presidency. That’s from money approved by Congress a year ago. Money approved by Congress this month to avert a government shutdown would cover about 55 more miles (88 km) and he’s trying unilaterally to free up money for more. Trump now often incorrectly portrays his wall as largely complete, with the rally cry, “Finish the wall,” which replaced his initial slogan, “Build the wall.” In fact, the barrier now in service — about 650 miles (1,050 km) of fencing — was put in place by previous administrations. TRUMP: “The failed Fast Train project in California, where the cost overruns are becoming world record setting, is hundreds of times more expensive than the desperately needed Wall!” — tweet Tuesday. Gov. Gavin Newsom, D-Calif., said earlier this month the project “as currently planned, would cost too much and take too long.” He said the state would focus on completing a shorter segment in the Central Valley while seeking money from new sources for the longer route. SEN. KEVIN CRAMER, Republican of North Dakota: “Barack Obama declared a national emergency to fight swine flu and we didn’t have a single case of it in the United States.” — podcast posted Tuesday. THE FACTS: Cramer is wrong. More than 1,000 people had died in the U.S. from the flu strain known as H1N1, commonly called the swine flu, by the time Obama declared a national emergency over the outbreak Oct. 23, 2009. The first swine flu death in the U.S. was reported in April 2009. By the time of Obama’s declaration, widespread flu activity was reported in 46 states. The government estimates the flu strain was linked to more than 274,000 hospitalizations and 12,000 deaths in the U.S. between April 2009 and April 2010, according to final figures released in 2011. Cramer’s false statement that Obama declared an emergency absent any deaths came as he argued that Trump was justified in declaring one to find money to build his proposed border wall. SEN. KAMALA HARRIS of California, a Democratic presidential contender: “The trauma these children experience will live on for decades to come. It’s absurd that it needs to be repeated: Ripping babies away from their parents to put them in cages is inhumane.” — tweet Wednesday. Children are held behind chain link inside Border Patrol facilities. Obama’s administration detained large numbers of unaccompanied children in such a manner in 2014 during a surge of migrant children at the border. Images that circulated online of children in chain link pens during the height of Trump’s family separations controversy — and blamed on him — were actually from 2014 when Obama was in office. The Homeland Security Department’s inspector general visited five detention facilities for unaccompanied children on the Texas border with Mexico in late June, during the height of the furor over family separations, and found the facilities appeared to comply with detention standards. The government watchdog reported that cleanliness was inconsistent but that the children had access to toilets, food, drinks, clean bedding and hygiene items. CALIFORNIA ATTORNEY GENERAL XAVIER BECERRA, on whether there’s a crisis at the border: “We have the lowest level of entries into the country by those that don’t have permission than we’ve had in some 20 years.” — interview with ABC’s “This Week” on Feb. 17. THE FACTS: He’s incorrect that illegal crossings are the lowest in recent decades, based on Border Patrol arrests, the most widely used gauge. That was true in the 2017 budget year, when Border Patrol arrests along the Mexican border fell to 303,916, the smallest number since 1971. But arrests jumped 31 percent last year, to 396,579. And in the 2019 budget year, which started in October, southern border arrests nearly doubled through January, to 201,497 from 109,543 the same period a year earlier. Illegal crossings remain relatively low in historical terms but not as low as Becerra claims. California is leading a 16-state coalition in a suit challenging Trump’s power to declare an emergency to steer more money to build a wall along the Mexico border. SEN. BERNIE SANDERS of Vermont, announcing his run for president: “We should not have an economy in which tens of millions of workers earn starvation wages.” — email Tuesday to supporters. According to his campaign, he defines “starvation wages” as anything below $15 an hour. But if a family, for example, has two people making $14 an hour each, working full time, that’s roughly $56,000 in household income before taxes. If they live outside large, expensive cities, their costs of living will also be relatively low. The Census Bureau considers a single parent with two children to be poor if they earn less than $19,749, or about $9.90 an hour. It’s true that many people with jobs are still poor. In 2016, census data showed that 7.2 million people were working, but still lived below the poverty line. It’s also true that a lot of workers — nearly 40 percent, or 60 million — earn less than $15 an hour, according to government data compiled by the liberal Economic Policy Institute. But wages have also been rising in the past several years for lower-income workers, thanks in part to higher minimum wages. For those at the 20th percentile of earnings — meaning that 80 percent of workers earn more — their wages rose 4.8 percent last year, more than any other income group, according to that institute. SEN. KAMALA HARRIS: “The average tax refund is down about $170 compared to last year. Let’s call the President’s tax cut what it is: a middle-class tax hike to line the pockets of already wealthy corporations and the 1%.” — tweet Feb. 11. THE FACTS: She’s wrong to suggest that smaller tax refunds basically amount to a “middle-class tax hike.” The size of a refund doesn’t necessarily have anything to do with how much someone is paying in taxes. Many people ended up with less of their taxes withheld from their paychecks in 2018 as a result of Trump’s tax cut. That would result in a smaller refund, but it doesn’t mean they paid more in federal taxes. Explaining the tweet, a campaign spokeswoman, Kirsten Allen, said “many middle-class families are seeing increases, while the bulk of the benefits go to corporations and the wealthy. And the long term analysis of this bill is that it raises middle-class taxes.” Allen also noted that high-tax states such as California are particularly affected because the new law caps the deduction for state and local taxes at $10,000. Trump’s tax cut did skew to the wealthy, but most middle-income taxpayers should see a tax cut this year, according to the nonpartisan Tax Policy Center. The average taxpayer is expected to get a tax cut of about $1,600 in 2018, the center calculates, with two-thirds of U.S. taxpayers getting a cut and about 6 percent paying more. TRUMP, on getting North Korea to “denuclearize”: “I think they want to do something. But you know, you’ve been talking about this for 80 years. They’ve been talking about this for many, many years, and no administration has done anything.” — remarks Wednesday with Austrian Chancellor Sebastian Kurz. Clinton reached an aid-for-disarmament deal in 1994 that halted North Korea’s plutonium production for eight years, freezing what was then a very small nuclear arsenal. Bush took a tougher stance toward North Korea, and the 1994 nuclear deal collapsed because of suspicions that the North was running a secret uranium enrichment program. Bush, too, ultimately pursued negotiations. That led to a temporary disabling of some nuclear facilities, but talks fell apart because of differences over verification. What has most advanced under Trump is the level of engagement with North Korea. He is the first to meet the leader of North Korea. TRUMP: “The Mueller investigation is totally conflicted, illegal and rigged! Should never have been allowed to begin, except for the Collusion and many crimes committed by the Democrats. Witch Hunt!” — tweet Feb. 17. THE FACTS: Trump’s frequent claim that Mueller’s team is “totally conflicted” to the point of being rigged is off the mark. He’s previously pointed to Mueller’s team, for instance, as “13 angry Democrats,” even though Mueller is a Republican and some others on his team owe their jobs largely to Republican presidents. Some have indeed given money to Democratic candidates over the years. But Mueller could not have barred them from serving on that basis because regulations prohibit the consideration of political affiliation for personnel actions involving career attorneys. Mueller reports to Attorney General William Barr, and before him, Deputy Attorney General Rod Rosenstein, who are both Trump appointees. Mueller was appointed as special counsel by Rosenstein in May 2017, eight days after Trump’s abrupt firing of FBI Director James Comey and the subsequent disclosure that Trump had encouraged Comey to drop an investigation into former national security adviser Michael Flynn, according to Comey, which raised questions about possible obstruction of justice. Trump has denied he told Comey to end the Flynn probe.